Scientific Background: Hsp47, also known as colligin and gp46, is an ER-resident collagen-specific stress glycoprotein involved in the synthesis and assembly of varoius collagens as a molecular chaperone. Hsp47 is a member of the serpin superfamily, but localizes to the ER via binding of its C-terminal RDEL sequence to KDEL receptors in the ER. Hsp47 binds procollagen co-translationally as it enters the ER, and dissociates prior to its secretion. 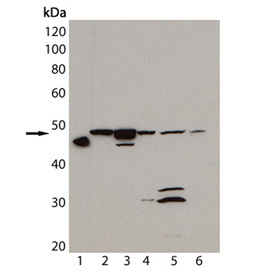 Western blot analysis of HSP47, mAb (M16.10A1) (Prod. no. ADI-SPA-470): Lane 1: Rat recombinant HSP47; Lane 2: Rat-2 (heat shocked); Lane 3: L929 (heat shocked); Lane 4: 3T3 (heat shocked); Lane 5: CHO (heat shocked); Lane 6: HeLa (heat shocked). Immunohistochemistry analysis of human breast cancer tissue immunohistochemically stained using Hsp47 mAb (M16.10A1). Immunohistochemistry analysis of paraffin-embedded tissue section of rat carotid artery 14 days after balloon-injury to the artery, stained using Hsp47 (Colligin) mAb (M16.10A1).